To lose one DS stylus may be regarded as a misfortune. To lose 4? Seriously? What the hell is wrong with you? Actually it’s not really four. Two are short styluses (styli?) 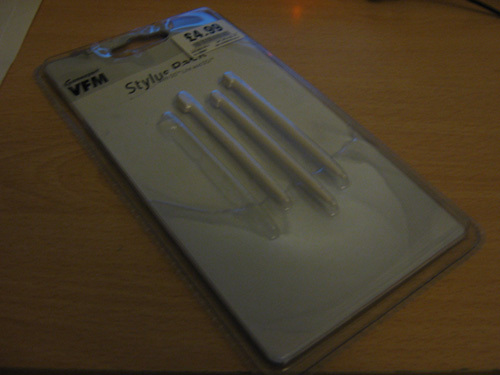 for the DS Lite, and two are long styluses for the DSi. Of course this is even more illogical. I now have two DSi styluses which are almost useless as they don’t fit in the hole of my DS Lite. To top it off, they come in absurdly large packaging, and it’s that damned plastic which I needed the help of my trusty swiss army knife to open. Posted on 25 August 2009 Author the_wubCategories StupidityTags ds, rant, stylus, waste, what?